“Nov. 13, 2002. 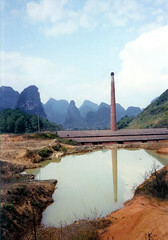 Yangshuo is the perfect cure to many long weeks on the road. I feel as though I could stay here forever. I am sure I’d grow tired of it eventually but for now it suits me just fine. I have managed to fall into the community somewhat – the staff at the 7th Heaven Café have befriended me. It is a lively place with a fun staff and great food. There is a roaming population of foreign tour guides who make 7th Heaven home, plus the usual collection of travelers coming from/going to S.E. Asia.